If you click on the above you should be able to see a slideshow of all the flowers in the garden today. Here in Italy it is a holiday today. The Ascension of the Virgin, is the religious element but really it is a bit like August Bank Holiday in the UK; the last holiday of the summer. Actually most Italians are away on holiday this week, many shops, factories, and offices are closed so the cities are empty. Yesterday was so windy I didn’t think there would be anything left in the ground to photograph. It was a hot drying wind from North Africa. Strong enough to lift a table and several chairs into the air and move them quite a distance. August is when all true Mediterranean plants hibernate. The garden looks parched, even the leaves of the bay hedge hang stiffly as if all moisture has been taken from them and they are ready to dry and put in a jar ready to use in a winter casserole! Anything that actually flowers in August has great value. One of the things that is looking very beautiful are the hips of Rosa rubrifolia; a sign of autumn rather than high summer, but they are looking lovely; it is strange as I don’t actually remember there being as many flowers as there are hips. Another sign that the end of summer is arriving is that the sedums are beginning to flower. This is the Datura I mentioned in another post. It is now about 2.5 metres by 3 metres; the flowers open at dusk, though the bees can’t wait to get into the strongly scented flowers so they make small holes to get to the nectar. As soon as the sun touches the flowers the following day they close again and die, though they do make interesting seed-heads. The other evening there were about 50 flowers open and the hum of the bees even in the dark was astonishing. 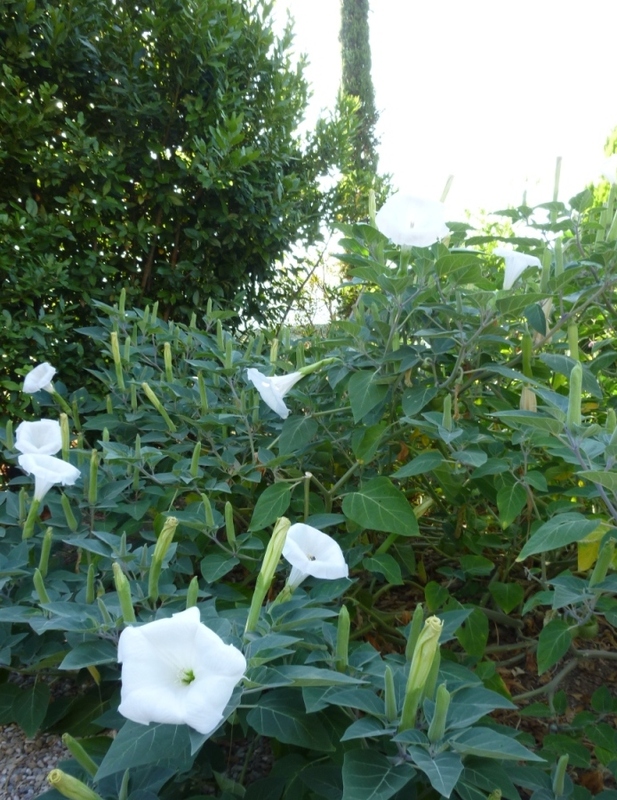 It is an herbaceous Datura that completed dies back during winter. The wind knocked down at least half of the sweetcorn plants, I don’t know if I’ll be able to rescue any of them by staking them. I will certainly harvest the cobs from those that have fallen and hope to be able to use them in the next few days. 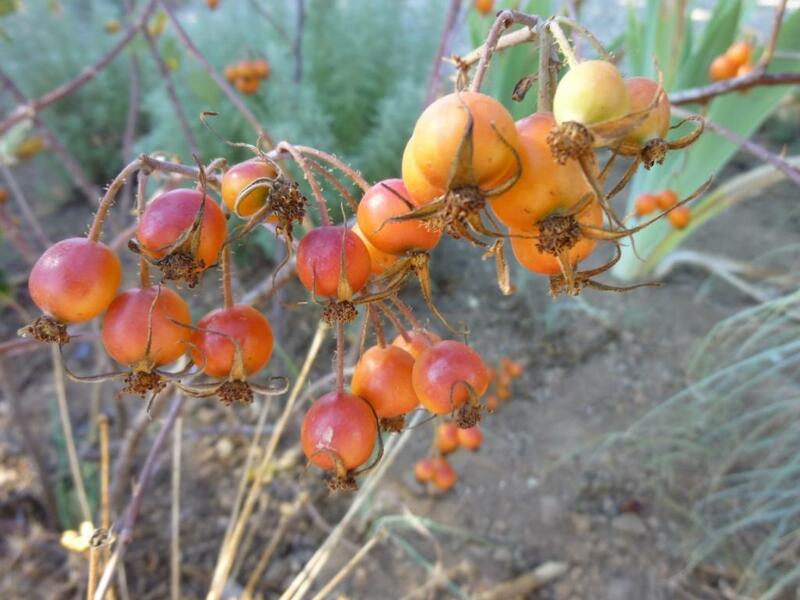 This entry was posted in Garden Bloggers Bloomday. Bookmark the permalink. We usually have 2 or 3 months without rain. In many areas there has already been heavy rainfall, we unfortunately just had thunder, lightning and WIND! Beautiful blooms, beatuiful blog… and so sorry about the wind. We get Canyon winds that often mess up my garden. But those same winds keep us cooler than surrounding areas. Can’t always have it all. Well we were lucky this time to actually get rain – very often the storms circle around Lake Trasimeno and send down bolts of lightning but no rain. You Datura is impressive and interesting to hear that it survives the winter. I really ought to have another go – what is yours called? The Datura was from a friend and I don’t know exactly what it’s called. I’ll try to find out. It survives the winter because it is herbaceous and completely dies back as soon as the temperature drops to zero. Where are you catmint? The link to your blog didn’t work so I can’t see your garden.